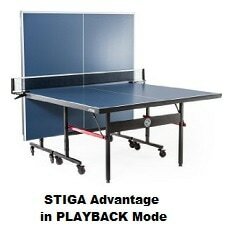 If you are looking for a superior quality and affordable table-tennis table (also known as ping pong table) for your home's man-cave or for your family room, to share fun times with friends and family while at the same time working out, you might want to consider those made by Stiga, Joola and Harvil, three of the best and most respected table-tennis equipment companies. These three companies make a variety of ping pong tables for a wide range of table-tennis experience. Those that are made for competitive levels are the most expensive as they require table thicknesses of 19mm or more. However, for non-competitive playing, more affordable 16mm tables are quite sufficient as they provide more than adequate bounce for leisure play. Indeed, the three under-$400 tables that will be compared below were at the time of this writing the most popular and best rated by Amazon customers who had used them. 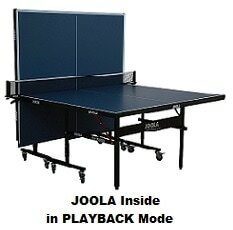 This article will compare Stiga Advantage, Joola Inside and Harvil I indoor ping pong tables. These were not just the most popular among Amazon customers at the time this article was written, but they had also received excellent reviews from most Amazon buyers (an average of at least 4.5 stars each out of 5 stars!). 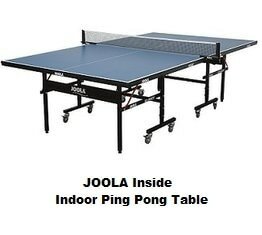 Selected Indoor Table-Tennis Tables on Amazon. All three tables have sufficent thickness for leisure playing at home. Note also that all three tables are made of MDF (Medium Density Fiberboard), and while this type of playing surface is durable, it is meant for indoor use only. Thanks to the casters these tables are equipped with, you can easily roll and move them around. Note that the casters are lockable for safety as well as for easy setup and convenient storage. All three tables can be easily setup in "playback" mode, if you want to play alone and practice your shots. All three tables are equipped with a safety latch system on the underside of the table. It is used to lock the table halves into the upright position either for the playback mode (see above images) or for storage (see images below). This is an important feature that prevents accidental opening which may cause an accident, specially if there are children around. 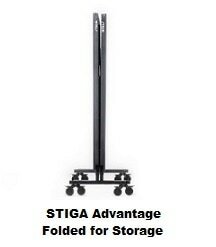 The STIGA Advantage features a unique chassis design where each table half has independent caster beams allowing the two halves to be completely separated and used as freestanding multi-use tables. Additionally, the independent design allows the table halves to nest into one another for ultra-compact storage. The table has a 1.5-inch steel apron that supports the top for even bounce across the entire tabletop. It also provides additional support to prevent warping over time. The tabletop is painted with an automated repeat roller coating process and then UV cured to create a smooth, durable, and consistent playing surface. The top is then lined with silkscreen striping that is printed directly on the tabletop for a perfect finish that is smooth to the touch. A clamp-style attachment the heavy-duty net is equipped with makes it easy to remove and assemble the net in seconds. Joola Inside also features a chassis design where each table half has independent caster beams allowing the two halves to be completely separated and used as freestanding multi-use tables. Additionally, the independent design allows the table halves to nest into one another for ultra-compact storage. The 1.5-inch thick apron of this table is made of resin. It provides support for even bounce and prevents warping of the tabletop over time. Additional support is offered by the 1.5 inch resin apron. ​JOOLA claims that the table top features higher quality materials, ensuring a quality bounce no matter the thickness of the table. Like with Stiga, the net has a clamp-style attachment that makes it easy to remove and assemble the net in seconds. HARVIL I has a sturdy wood tabletop that is supported by a powder-coated steel frame. Like the Stiga Advantage and Joola Inside, it features a chassis design where each table-half has independent caster beams allowing the two halves to be completely separated and used as freestanding multi-use tables. Additionally, the independent design allows the table halves to nest into one another for ultra-compact storage. The under-construction is solid and the folding mechanism works easily and smoothly. The caster beams are equipped with locking wheels that allow a portable and non-permanent set-up. The 1.5-inch thick resin apron with steel under carriage provides support for even bounce and prevents warping of the table top over time. The table net has a clamp-style attachment that makes it easy to remove and assemble the net in seconds. These three tables come almost completely pre-assembled out of the box for quick and easy setup. The self-opening design that automatically deploys the legs from storage to play position. The setup process simply consists of attaching the caster wheels to the frame and tightening a few screws. It takes a mere 10 -20 minutes to do the job. So which of the three compared ping pong tables is best for you? They are made of durable MDF (Medium Density Fiberboard) and are meant for indoor playing only. They can be split in two half tables to configure them for playback mode or to fold them for compact storage. They are equipped with lockable casters, so they can be easily moved around. ​They are equipped with a steel/resin apron that provides support for even bounce and prevents warping of the table top over time. If you need the tabletop to be thicker than 16mm, you should consider JOOLA Inside as it offers a choice of 16mm, 18mm and 25mm thick tabletops (see Amazon products section JOOLA link below). If you prefer a sturdy wood tabletop that is supported by powder-coated steel frame, you should get Harvil I.
Harvil will also ship new replacement parts or an entirely new table for free in the event of defect or damage. If you prefer a heavier table for better stability and a tabletop with a great finish, you should consider STIGA which is the heaviest of the three and has a tabletop that is painted with an automated repeat roller coating process and then UV cured to create a smooth, durable, and consistent playing surface. Please click the ping pong table of your choice below for price information or to purchase. Competition-grade 9'x5' regulation size outdoor table tennis table and net set - perfect for your deck, backyard or playground. Comes 95% pre-assembled. Assembly time: 10 minutes and you’re ready to play! Simply attach the legs with only 8 bolts. The tournament grade net is a classic screw clamp design for easy attachment. Table sits on extra-large, heavy-duty 6-inch off-road caster wheels and the adjustable leveling feet make this table compatible with almost any terrain. 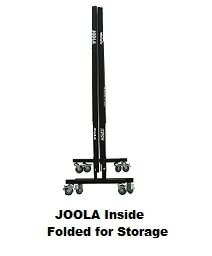 Separate halves for playback mode and compact storage: Folding halves sit on separate 4-wheel trolley systems for mobility when alone or nested together. Utilizing the automatic anti-tilting locks, easily unfold one table half for solo playback mode. Made by the official table brand of US Open and US Nationals Championships. USATT Approved.